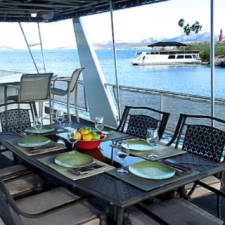 The marina, located at the Nautical Beachfront Resort, offers convenience and ease to customers renting houseboats at Lake Havasu. The docks are just south of the prime spot channel under the London Bridge and just a few minutes north of the cliff jumping spot in Copper Canyon. The resort is Lake Havasu City’s only hotel located right on the beach. The resort offers a trendy boutique, general store and multiple dining facilities including a beach bar. There is also a watersports center on-site that rents jet skis, paddle boards, ski boats, wakeboards, and water skis. Since the houseboats are due back by 2:00 p.m. on the last day, many people opt to stay an extra night at the resort prior to heading home. This allows everyone to relax and get their land legs back, as well as, enjoy the number of dining and nightlife options in the area.